Put me in the “likes his pickup truck” category portion of any survey, because my truck holds most everything I don’t want to trailer. Unfortunately for me, not everything fits into the pickup bed. 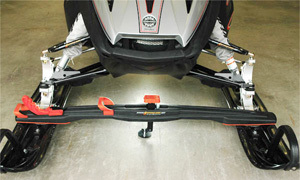 One ATV or a small sled will fit, but not two or a stretch track sport sled. So, it’s back the truck up to the trailer and haul away. Over the years, like many of you, I’ve learned the hard way to stop fussin’ and start lovin’ my trailer. That’s one reason for purchasing a top grade hauler with a good axle, durable road-going tires and easy towing features. It’s also the reason that, every season, we check out what’s new — or old and we just missed it before! — so we can make using our trailers easier. When we travel alone, we’ll try to park an ATV in the bed of the truck, but it’s gotten so that it’s easier to use our single-place trailer to haul a new test sled. That’s because, believe it or not, we’ve found that with a little tender care and pre-planning for the season, we can outfit the trailer to make our life easier. We installed a boat-style winch on our single place that let’s us tug a stubborn sled up the trailer’s tilt ramp. It works great for helping secure the sled in place, too. That item cost us about hundred bucks and 30 minutes of time, most of it spent looking for the right wrench, of course. Heading into this season, we’ve added a few items again. The slippery slides on the bed let the carbide-edged skis slip forward. The added mat pieces give the track something to grip. But, we’ve been admiring a few other items as well. Because we have a trailer with proprietary grooved slides to fit the tie downs, we tend to favor its own brand of locking device. But we’ve been known to need an occasional tie-down bar. 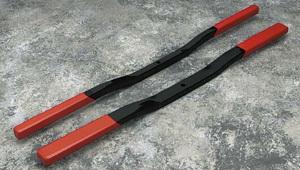 Those can be ordered from a number of places, but many dealers and outlets stock Parts Unlimited’s steel or aluminum “snowmobile tie-down system.” The steel bars retail for about US$30 and are powder-coated with red vinyl end sleeves. The aluminum bars cost about US$50 and measure one-inch by two-inches with black vinyl end sleeves. 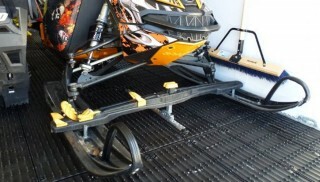 Either type covers 48 inches in width, which will secure most sleds. The system includes 10.5-inch long cranks that fit a ½ by 13 thread pitch. There are steel crank plates available to replace any on your trailer that may be corroded or stripped. But now is the best time to be making these repairs, so check it out, as these pieces will retrofit virtually any trailer deck. While the basic cranks work fine, you might want an upgrade and that’s what you’ll get with the Trailer Tie-Down Cranks by SporTech (Retail about US$25). These make a great replacement as the black plastic handle spins easily for a quick ratchet-like movement that lets you tie-down your sled fast and easy with added leverage. The tie-down cranks measure nine-inches in length and have a 6-inch overall width. They are available in one of two thread sizes — ¾-in by 10 or ½-in by 20. To find a local dealer, visit http://www.sportechinc.com/ for the company’s dealer locator. There are alternatives to the traditional tie-down system, which works well except when it snows heavily or your trailer bed gets iced down and you have to hunt for the tie-down locations. One of the best alternatives we’ve seen comes from Superclamp, which now offers its Superclamp II Tie-Down Bar System for just under US$200. This system not only features a unique clamping operation, but the Superclamp II is said to be the world’s first fiber-filled composite tie-down, giving a light 5-pound weight. Other features include a gull wing structure, pistol grip handle, lock key, and ribbed silicone rubber pads designed to protect your sled’s skis. Superclamp states that its system is fast and easy to install, and once installed makes securing your sleds a simple and quick process. The design allows the use of your own keyed lock to deter theft. In addition to the ski mount tie-down, Superclamp offers a unique locking device that secures the sled’s slide rail with a tension adjuster knob and built-in safety locking system to provide additional protection for your multiple thousands of dollars investment. The suggested retail is about US$150. Like the Superclamp II the rear device is also constructed of a composite material for light and easy operation in all types of road conditions. The composite material should be resistant to virtually all road grime, including salt and other corrosives. 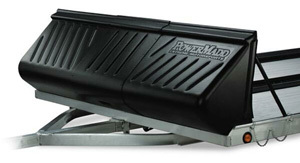 If you have an open trailer, you should seriously consider a salt shield like this PowerMadd one or a Caliber Products design, available through many snowmobile aftermarket or trailer outlets. Open trailers offer unique challenges to your snowmobile as road salt can take its toll on any new sled. To help protect your sled, consider a front-mounted poly-shield such as the ones from Powermadd or Caliber’s Trailer Poly-Shield Series II Salt Shield, which retail for about $250. Such shields can be installed on virtually any straight-edged snowmobile trailer and some V-front trailers. The shield is constructed and molded of high-density plastic that gives the shield its rigidity and strength in even the coldest weather. The Poly Shield III sits 25.5-inches high and can be fitted to trailer from 95 to 102 inches in width. There’s a quick-detach kit, which allows you to remove the shield for easy drive-off unloading. You’ll find that the molded spray channels not only aid aerodynamics for your trail but also direct road spray away from your sleds. In addition to the poly shield protector, you might want to consider an even simpler but nice-to-have back of the trailer accessory from the same company. 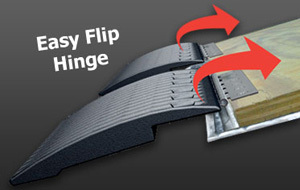 The Edge Glide seems like one of those, “why didn’t I think of that” products as it provides a smooth edge transition from your trailer bed to the ground and effectively eliminates the “climb over” edge that sometimes catches a ski runner when loading a sled. The 9-inch wide piece is made of the same slippery high-impact plastic used in the salt shield and can be secured with stainless steel screws. Made in the USA and offered by this Minnesota-based firm, the Edge Glide retails for US$25 to US$40 depending on model. 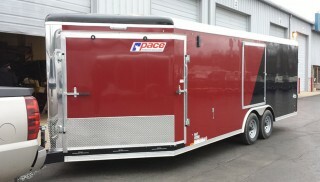 There are hinged models suitable for enclosed trailers and glides without hinges for your open bed trailer. 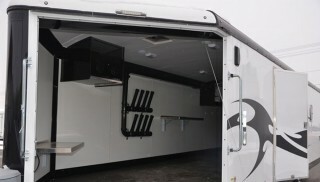 For those of you with enclosed trailers and multiple axles —thus multiple tires — another product of interest would be the nVision Tire Pressure Monitoring System (TPMS) developed specifically for RVers and those who tow. The system retails for about US$300 and is designed to monitor tire pressures on your trailer or even a towed vehicle. Using the nVision TPMS monitors means you won’t need to walk round your rig “feeling” if the tires seem at the right pressure. You simply purchase enough sensors to monitor all the tires on all your vehicles and program them into the portable monitor, which goes with you in your tow vehicle. The set allows you to track up to 24 tires at the same time, which means you can monitor your tow vehicle, your trailer tires and any spare tires. The device works on any size tire up to 150 psi and is easily transferable between your vehicles. 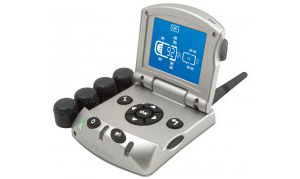 The basic system consists of a monitor with a non-skid pad, power cord and four tire sensors.